I first became acquainted with paella in my high school Spanish class. We played endless games of Scrabble in Spanish and memorized endless dialogues. Does the following dialogue ring a bell with anyone? "Esta Susanna en casa? Si, esta con una amiga...."
I was the fortunate winner of a copper bottom paella pan from a contest sponsored by Michael West, hostess of Designs by Gollum. Thank you Michael! See the clouds and my red geraniums reflected in the copper bottom? I love the shape of the pan. This is MY version of paella. Traditional paella has seafood in it; seafood and I don't get along. Have I ever told you about the time that I was coerced to eat an oyster shooter by my colleagues at a very fine seafood restaurant? As soon as I ate it, I ran from the table. They could have told me that you are not supposed to chew! Okay, I didn't think I was eating Jell-O. I digress, so this is my version of a sausage and chicken paella; it is delicious and easy to make. Usually paella is seasoned with saffron. Saffron is a very expensive spice; one bottle retailed for $18 at my grocery store. So, I cheated and used Mahatma's saffron rice. Place pepper, onion, garlic, sausage, and oil in paella pan or medium-sized dutch oven. Saute until sausage is browned and thoroughly cooked. Add chicken, chicken broth, tomatoes, rice, and red pepper flakes to the sausage, pepper, and onion mixture. Bring to a boil and simmer 45 minutes to 1 hour on low heat. Garnish with onions and olives. Note: If you used arborio or long grain rice, you will need to kick up your dish with some additional spices, such as cayenne pepper or saffron. Now you know that yellow mushy rice doesn't make for a great photo. This sounds delicious, Joni. I've always wanted to try paella, but never have. Maybe the time has come to try it. 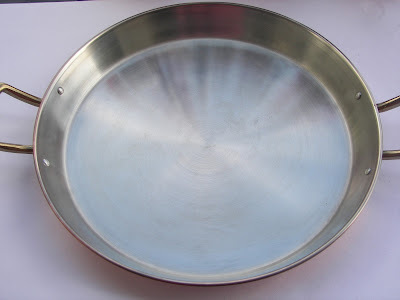 Your pan is just stunning! I need to make it again. I think I did it once, but what a pan to serve it in. 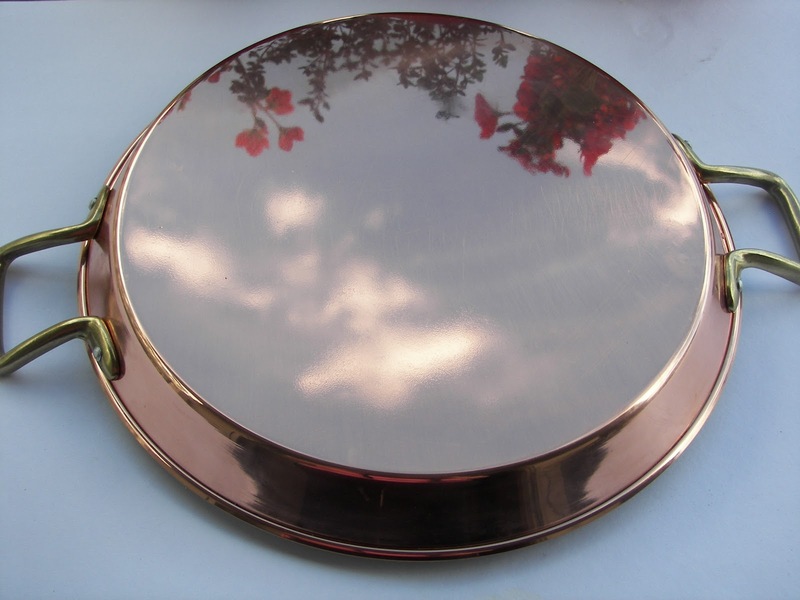 We have nice stainless ones we got in Italy last time, but this copper is great. What a lucky girl you are. We are home! The computers didn't work well over there and wouldn't let me on to comment, then when we got to Italy her computer wouldn't upload so I will just have to do the trip now. Lucky you, what a great pan! I haven't made paella in ages, the seafood got so expensive! Lobster tails, no way! Yours sounds like a delicious affordable version! I love paella - but the kind with seafood. We make it every summer and have guests to share it. I'll have to look for that rice! Sounds delicious...I love saffron flavored rice. Great paella pan. 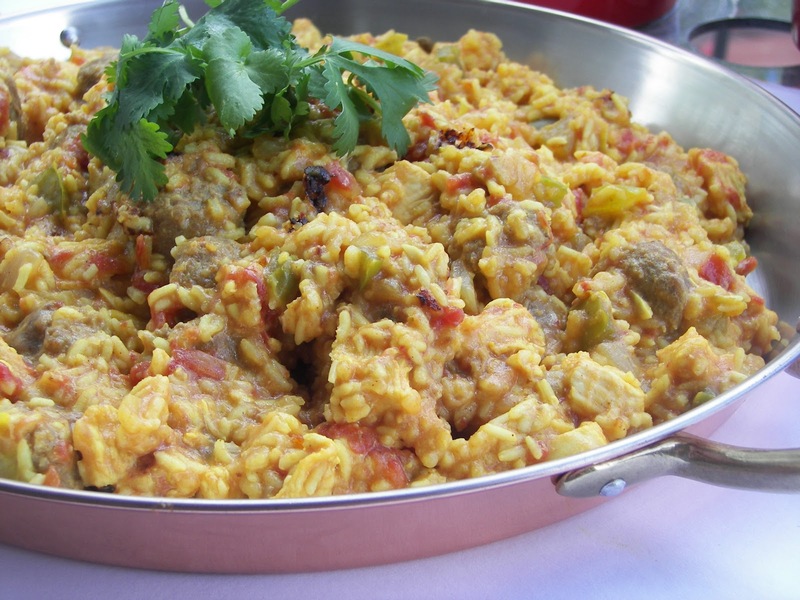 This sounds like a delicious, easy and affordable way to make paella! What a beautiful paella pan - congratulations! 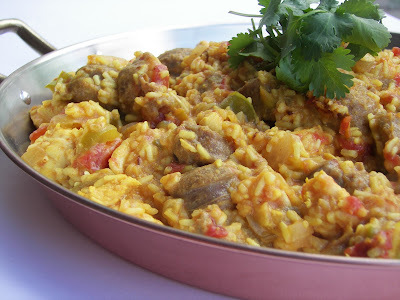 Paella is one of those dishes that I have always wanted to make but never have. It looks delicious. I don't know, I think it looks like "stick to your ribs" deliciousness:) I've never made paella, but we even have some saffron that my husband picked up at Costco. What a nice shiny pan you won~congrats! Congrats on winning the beautiful pan! I have been putting off buying one and I love paella. And I already have the saffron ;o) I always order paella when we visit my MIL in New York City. Your recipe sounds delicious! I love saffron but it is too pricey for me. 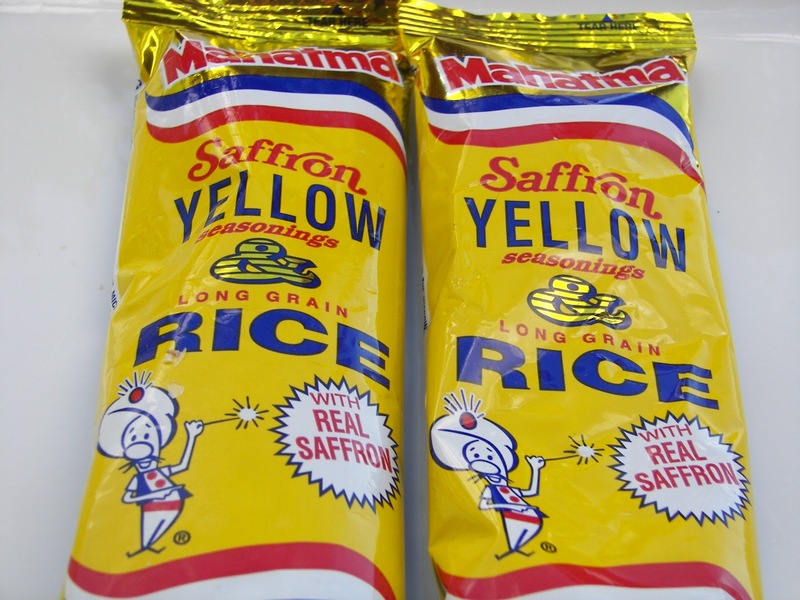 I've seen the yellow rice but never bought it, this looks like something we would LOVE. Thanks for another great recipe!